Will the TX-L60ET5 live up to its looks? 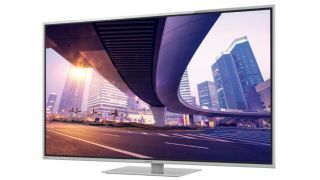 Panasonic's biggest ever LED TV is the 60-inch Smart Viera TX-L60ET5, unveiled at IFA 2012. It's a 3D-friendly TV with its tri-dimensional images coming at you in polarised 3D (meaning the four bundled pairs of glasses won't be too cumbersome on your face) and there's the option to convert 2D to 3D in real-time too. Panasonic's done a bit of work to the backlight control so the TX-L60ET5 has increased the number of generated frames from 50 to 100 frames per second through area splitting; this results in better contrast between light and dark. That's according to Panasonic itself, of course - we'll let you know what we think when we get our hands and eyes on it. The TX-L60ET5 is crafted from glass and metal with a slim bezel and a waist-size of 1.5-inches. Connectivity-wise, there's built-in Wi-Fi, DLNA compatibility and four HDMI ports. The green conscious will be pleased to hear the LED TV comes with an energy rating of A+; good news for electricity bills everywhere. The TV also comes with Viera Connect, which has had a bit of an upgrade for IFA 2012 too; there's a new kids channel on the cloud service, and some new apps including a World Heritage Special App which comes by way of a partnership with the National Geographic Channel. You can control some of Panasonic's Viera TVs with a smartphone or tablet using the Smart Viera Remote App, which has also had a bit of a spruce up for IFA. You can now swipe content on to your television from your mobile device, as well as pulling content from an SD card plugged into the TV back on to your tablet or phone. Last but not least in the audio-visual line up from Panasonic is the full HD-toting 3D home cinema projector, known by the catchy monicker of the Panasonic PT-AT6000E. With 2,400 lumens of brightness and a ridiculous 500,000:1 contrast ratio, it has been developed in collaboration with Hollywood filmmakers at the Panasonic Hollywood Laboratory. Get you, Panasonic. As a result, Panasonic claims less crosstalk than its projector predecessors and images that are 20 per cent brighter.